Managing water continues to be a major challenge, ensuring the right amount in the right place at the right time. Access to water can dictate farming regimes and influence crop performance, and regulation around water management are driving investment in new solutions, both on and off-farm. Here we’ll be considering innovative products, services and practices to help re-use, recycle and retain water in the farming ecosystem. 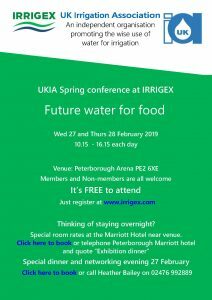 With an emphasis on the practical aspects of water management, we’ll be looking at topics such as smart irrigation, monitoring of leaks, soil moisture retention and water storage options. With speakers confirmed from Verdesian, Anglian Water, the Norfolk Rivers Trust and Cranfield University, book now for the chance to understand more about new solutions to manage one of our most precious and unpredictable resources. The UK-YWP is the best opportunity for young professionals working on the water to network, share skills, ideas and opportunities, and learn from each other. The Conference will have a mix of regular sessions, keynotes, PICO poster sessions, career fair, social and technical visits, and much more. Young Professionals from all sectors are welcome.